Jim Yorkston’s exhibition opened at the Filmhouse last night. Rima, Jayyus © Jim Yorkston 2014 all rights reserved. Dreaming of Jerusalem © Jim Yorkston 2014 all rights reserved. DS – What’s this new work about and how did you get involved with the project? JY – This project was conceived and created for the Jill Todd Photographic Award 2013. Having completed my BA in Professional Photography I was eligible to apply to the award and, I felt it would be a good way of maintaining the momentum of the course by working on a fresh project with a hand in date. 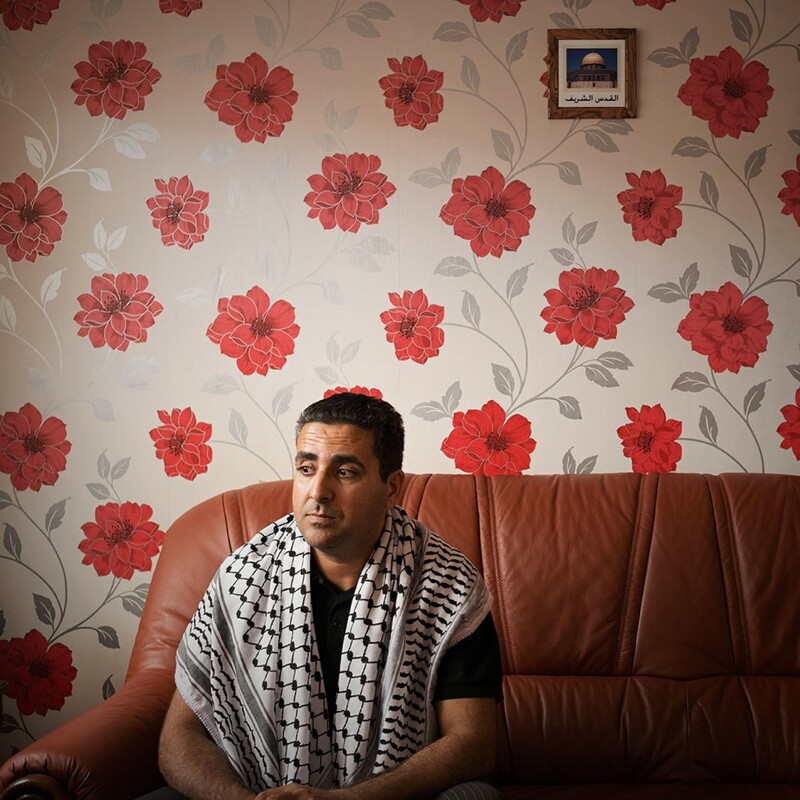 ‘Haneen lil watten’ (a yearning for my homeland) began as a series of photographic portraits resulting from my encounters with various Palestinian people living in Scotland. Using ‘home’ as a central theme, a fluid and diverse concept to people of Palestinian descent, each sitter is viewed in a moment of contemplation as they think of ‘home’. Through the portraits I also wanted to describe the objects and items the people kept close to them as reminders of home, and as a continuation of their culture from afar. 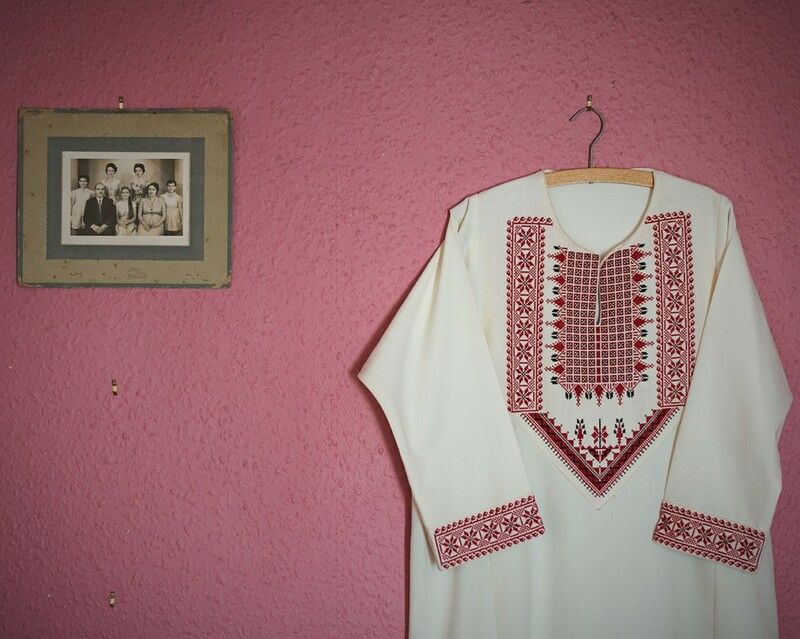 This led me into looking closer at the textures, which seemed to be a prevalent across the different homes I visited and which are also an important part of the Palestinian culture. Ahmad – Ya’bad © Jim Yorkston 2014 all rights reserved. Hadeel #1 © Jim Yorkston 2014 all rights reserved. JY – For as long as I can remember, I have had an interest in Palestinian history and affairs so ‘Haneen lil watten’ has been, for me, a personal exploration of the issue of Palestine, now shared with a wider audience. My reason for including the mixture of portraits and details and textiles was I wanted to get away from only showing a portrait after a portrait, I feel this can sometimes become repetitive. Because the main theme of the project is ‘home’, I felt the objects that some of the people keep as reminders of home were very interesting and appropriate for inclusion in the project. I regard the images of details to be as much a portrait as any of the images with people in them. The hand woven textures were an ever present over the project, appearing in nearly every home either as cushions, dresses or wall decorations. They are regional in their design and speak specifically about certain regions, so they exist almost as a form of visual communication in this regard. The longer you look at these designs you can almost feel the hands that created them and I started to wonder if this is why they are retained by so many of the people I was photographing. Apart from being beautiful, was this a way to physically touch their homeland? Their bothers and sisters? Their past? I know that photographically they are very graphic but by including them I am personally moving into new territory. I really think they fit well into the project but I will be interested to hear from others, a lot more qualified than me, to see if they concur. This is all still a learning curve, in regards to editing a project, selecting the images to be shown and deciding what doesn’t make the final edit. These are early days for me and I won’t get it right every time but I am open and keen to listen to constructive feedback and I will take that on board for the next project. Anita, Jerusalem © Jim Yorkston 2014 all rights reserved. DS – How did you meet and find your subjects? JY – I made initial contact through the Scottish Friends of Palestine group and from there once I had met the first person and explained who I was and what I hoped to achieve, each person seemed to lead to the next. Attending Palestinian cultural events and meetings also helped make further contacts, and these in turn, helped me understand the subject of Palestine further. I must say that, the people I have been introduced to throughout this project have been, amongst the most welcoming and hospitable people I have had the pleasure to meet and I am very grateful for their understanding and eagerness to help me make this work. Ghazi Safad © Jim Yorkston 2014 all rights reserved. Hadeel #2 © Jim Yorkston 2014 all rights reserved. DS – Congratulations on being shortlisted for the Jill Todd – tell us about that experience. JY – Being involved in the Jill Todd Award has been a great experience and the portfolio review with Tom Hunter was invaluable. It was very interesting to see the other entrants’ interpretation of the central theme of the award and the experience of being part of this can only serve to strengthen my practice going forward. Although the creation of this award has been brought about through what are tragic circumstances, it exists and continues to grow as a fitting tribute. I think the people behind the award should be proud of what they have achieved and I would encourage every graduate to support it and get involved. Hala, Ramallah © Jim Yorkston 2014 all rights reserved. DS – what else are you working on, what’s next? JY – Since graduating I have been assisting David Eustace, in my opinion, one of the finest photographers around. Whilst studying I always held David’s photography in the highest regard, so to have the opportunity to continue to learn from him is very rewarding. Tasnim & Yasmina, Jenin © Jim Yorkston 2014 all rights reserved. Thanks for sending us the work Jim and for answering our questions. Good luck with the exhibition. © Sophie Gerrard 2014 all rights reserved. ‘Haneen lil watten’ is exhibited at The Filmhouse Cafe, Lothian Road, Edinburgh and will be shown as part of the Middle Eastern Film Festival 2014, from the 11th-27th of May.